Open those sketchbooks and dust off the pens! 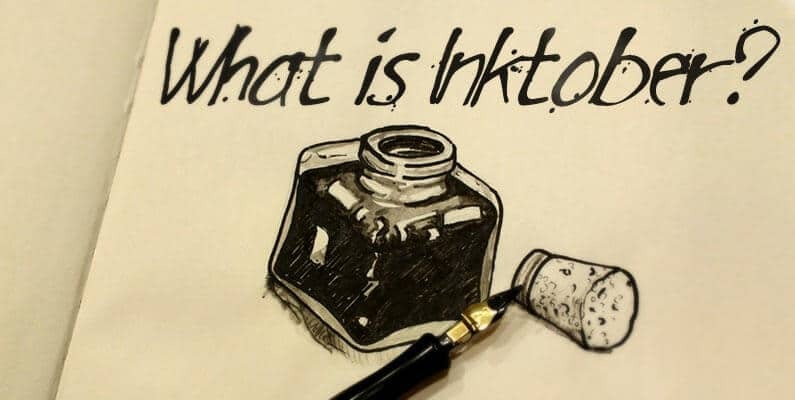 Inktober is here, which is an initiative to spend some some quality time sketching and inking drawings and illustrations. Join the initiative and add your works to the influx of great black and white drawings that pop up all over the internet during this time of year. Here are the rules -pretty easy, huh? But wait, What if you find out about Inktober, but the month is already partially over?? Answer: Just join along! After all, it isn’t about being perfect, but developing a consistency which leads to artistic improvement. Need some ideas about what to draw? Artprompts.org is a great place to start! Use our prompt generators to find an inspiring idea. There is also an official prompt list if you would like to try following along! Here is a smattering of inspirational art that others have created for Inktober. Need some Youtube videos for inspiration? Hey, it’s a great challenge for artists! Lets upgrade our skills. So are you allowed to use colored inks? Sorry that was kinda a stupid question but I have another one, are you allowed to use ink and bleach? Hey, can I post my drawings on Twitter?